Over the course of the last few decades, and especially with the rise of Internet gambling since the turn of the millennium, Texas Hold’em poker has overthrown Seven Card Stud and draw games to become the high king of all poker styles. 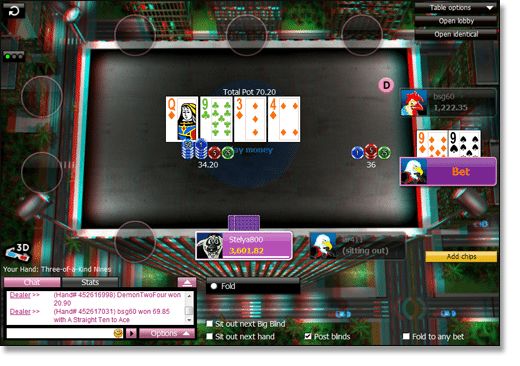 Hold’em is a flop-style game which features five community cards dealt face up on the table – aka, “the board”. All players can use these to create their strongest five-card hand, in conjunction with two private hole cards. This game is characterised by its four betting rounds, which allow for a range of strategic approaches – especially in No Limit Holdem (NLH), the format used for the World Series of Poker (WSOP). Before we are dealt any cards, the two players left of the dealer button – which moves clockwise from player to player after each hand – must post blinds. These are forced bets which ensure two things: that players must make a wager to remain in the hand; and that if everybody else folds, there is something in the pot for the last man standing. Some games use an ante instead of, or as well as blinds, but this is not especially common these days. The player immediately left of the dealer plays the small blind, while the player left again puts up the big blind. Then each player at the table is dealt two face-down pocket cards, and the “pre-flop” betting round begins with the player left of the big blind. They can choose either to match the big blind (call), play a larger bet (raise), or discard their cards and so forfeit the hand (fold). Once every remaining player has matched the highest bet, the first three community cards are dealt face-up on the table. This is called “the flop”. Betting now begins with the player on the dealer’s left, as is the case for all rounds that follow. Unlike the pre-flop, before betting is opened we can choose to “check” – that is, stay in the hand without placing an additional bet. Thus, it is possible to complete the round without any new wagers being laid. When the flop round is settled, we enter “the turn”, where the fourth public card is dealt, and again we decide whether to check, bet, or fold. Then we proceed to the “the river” – the fifth and final up card and the last round of betting action. If the pot is still contested after the betting is done, then it goes to a showdown where the remaining players reveal their hole cards. The order here follows the run of play – so whoever betted first, shows first. 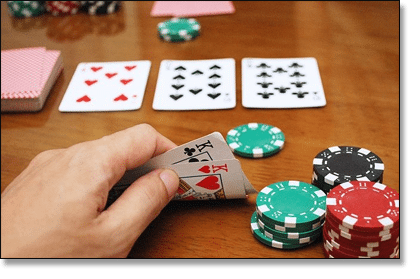 Using any combination of hole cards and board cards, the player with the strongest five-card poker hand wins the pot. A Royal Flush is the highest-ranking hand in Texas Hold’em (a 10, J, Q, K and A of same-suited cards), and you can’t be beaten if you hold this hand. Betting structure plays a huge part in defining the character of a Hold’em poker table. Some rule sets are strict and encourage more aggressive play, while others are much more liberal and require players to exercise caution and restraint. Often simply called Limit Hold’em, here we must stick to a set of fixed betting options. In the first two rounds of action, we can only bet and raise the same amount as the big blind – so if the big blind is $2, then all bets and raises must be to the value of $2 as well. For the turn and the river, these amounts are doubled. As such, this type of game is referred to by the size of the small bet and the big bet – so a $2/$4 Limit Hold’em table has a $2 bet on the pre-flop and flop, and a $4 big bet on the turn and the river. The small bet is typically the same size as the big blind, while the small blind is often half that – depending on the stakes. For example: a $25/$50 Fixed Limit Holdem game would have a big blind of $25 but a small blind of $15, just for the sake of rounding up from $12.50 (half of $25) to a more convenient number. In Fixed Limit Texas Hold’em, we are restricted to a maximum of four bets in each round. This includes our initial bet, a raise, a re-raise, and a fourth and final wager known as “the cap”. This is the most prominent form of Texas Hold’em, as featured in prestigious high-roller tournaments such as the WSOP Main Event and the Aussie Millions Main Event. There is nothing ambiguous about the “No Limit” tag – for we can bet as much as we want at any time, up to the entire amount of our stack. All raises must be at least twice the value of the call bet – so if it is $5 to call, we must bet at least $10 to raise. Unlike fixed-limit poker, NLH games are referred to by the size of the blinds. So, for example: if the small blind is 1$ and the big blind is $2, the table would be labelled as $1/$2 No-Limit Holdem. Also, there is no cap on the number of bets or raises we can make during a round. 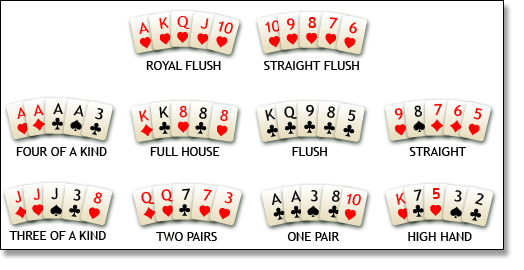 More often seen in Omaha Hi poker (a similar flop game where players take four hole cards instead of two), pot limit rules float somewhere in between the no limit and fixed limit formats. Like NLH, all raises must be at least twice the call value, there are no caps on the number of bets per round, and games are labelled according to the size of the blinds. However, the maximum bet in Pot Limit Holdem is restricted to the total amount of cash in the pot. This means the highest possible wager increases as the hand progresses and more bets are made. One important point which is often overlooked is that the pot limit includes all active bets on the table at any given time. For example: let’s say the pot has $300 in it, made up of all the bets from previous rounds; but if there are three wagers of $50 currently in play, the live pot’s actual value is $450. Furthermore, when the betting has already been opened, we must take the cost of the call into consideration when calculating the max bet. So if there is $500 in the pot at the start of the round and Player 1 opens with a $100 bet, Player 2’s maximum wager would include the $500 in the kitty, the $100 on the table, and their own $100 for calling Player 1’s bet. Thus, the most Player 2 can raise by is $700. In Mixed Limit Hold’em, we interchange between limit and no-limit poker rules after each hand. In an effort to keep the pot size relatively consistent from round to round, the blinds are often bumped up when the play reverts from NLH back to Limit Holdem. Hold’em poker is ubiquitous these days, and so Australians have loads of options when it comes to playing via the Web. For our money, the best Texas Hold’em site going around is 888 Poker. Aussies can choose from thousands of Internet cash games, multi-table tournaments, and sit-n-go poker rooms, as well as satellite events which could lead you all the way to the World Series of Poker or the Aussie Millions. We can also indulge in special features like 3D Poker and PokerCam – exclusive to 888 – as well as mobile Hold’em for iOS, Android and other smart devices. We could go on for ages about the finer points of hand strategy, pot odds, playing tight and loose – but we’ll save that for another article. In the meantime, here’s a few simple tips to abide by whenever you are at the tables. The golden rule of Texas Hold’em poker: never go in on an unsuited 7-2 in the hole. This is the worst hand you can be dealt in the pre-flop, and there is really no situation where betting on it is a good idea. Fold, always. Don’t bet too hard before the flop, even with a pair of Aces or Kings. Even though you might have the strongest hand possible, you never know what cards will turn up on the board. Be quietly confident, but not reckless. If the flop hurts you, don’t hesitate to fold – especially if you had a middling hand to begin with. There is no point getting sucked all the way down the river on a pair of Sevens when you know the draw favours anyone holding high cards. Cut your losses and move on. When you are the big blind, it may be worth paying to see the flop even on a weak hole hand. You’ve already got money on the table by default, so if the pre-flop betting stays sensible there’s little harm in stumping up the call bet just to get a look at the first three cards. Be emotionless. Don’t get attached to a solid-looking hand when you know it probably won’t win, and don’t get cranky when you suffer a run of awful hands or unlucky draws. This happens to everyone, but the best players are the ones who understand it’s all part of the game and brush it off.